Early motherhood can be trying for any mom, as they adjust to a new lifestyle and less sleep. Many refer to this adjustment period as the “baby blues”, and they can last for a few days or weeks. In addition to all of the life style changes, mothers are dealing with the readjustment of their hormonal balance. For some mothers this time can be even darker, with more extreme symptoms that can last for many months on end. When this occurs, they are likely dealing with more than just baby blues and may be experiencing Postpartum Depression (PPD), which can affect 1 in 7 new moms. According to the Center for Disease Control and Prevention (CDC) up to 20 percent of new mothers experience some type of Postpartum Depression. Women with PPD experience sadness and anxiety for weeks on end, that impacts their ability get their the normal daily routines. It’s important if they feel they are experiencing more than just “baby blues” that they seek out professional support and psychiatric care, so that they can find support and relief. 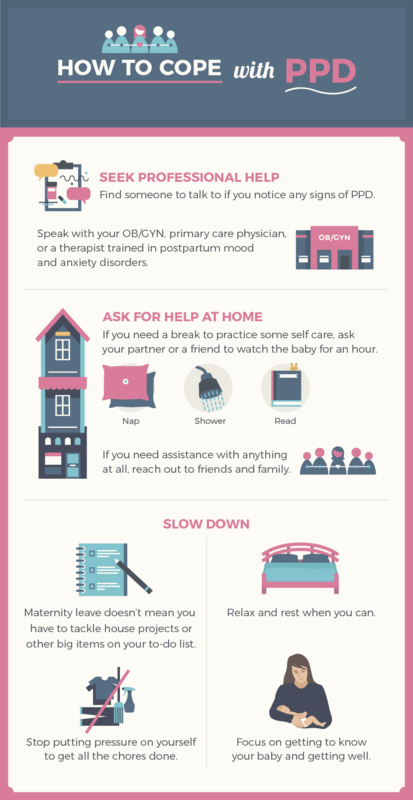 Postpartum depression can look very similar to “baby blues” and other types of depression. How do women know if they just have the “baby blues” or something more serious? These symptoms usually appear within a few days of giving birth and can last for a few week. 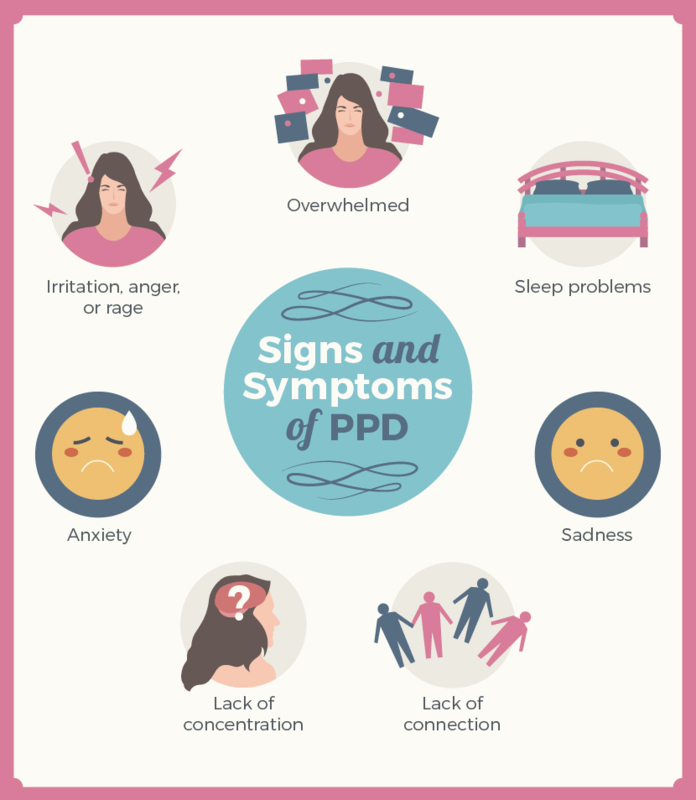 While there are many similar symptoms to the “baby blues”, women with PPD have more intense symptoms that last longer. While it typically begins with the first weeks after giving birth, some women may not experience symptoms until months, sometimes even a year later. The last two symptoms are also associated with a more extreme condition known as postpartum psychosis. While more rare, it may lead to life-threatening behaviors or thinking and should be treated immediately. Other postpartum psychosis symptoms include hallucinations, disorientation, paranoia, obsessive thinking, and attempts to harm yourself or baby. Some women are at a higher risk to experience PPD. If you believe you may be at a higher risk it’s advised to begin seeking professional treatment before giving birth to help reduce the impact. It’s important to continue treatment when symptoms begins as well. 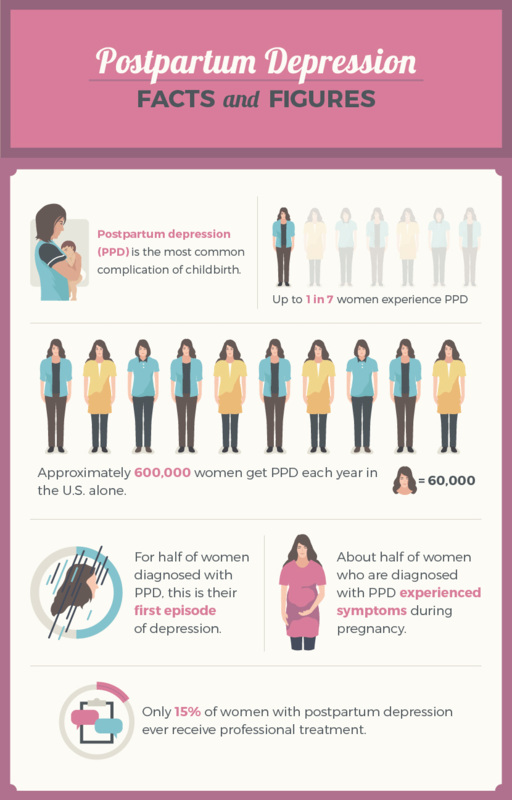 Depression symptoms before or after a previous pregnancy, note that some women may not experience PPD with every birth though. Stressful life events such as death of a loved one, abuse, or loss of a job during or after pregnancy. A lack of strong support system from the father, family, or friends. Treatment for PPD is similar to other forms of depression and includes Cognitive Behavioral or Interpersonal Therapy. Sometime antidepressants may also be prescribed. While most antidepressants are safe to take while breastfeeding it’s important to discuss the risks and benefits before beginning medication. If you every experience suicidal thoughts or thoughts of harming yourself or baby, it’s important to seek help immediately. Try to find support for care of the baby and call your doctor or 911 immediately. The toll-free 24-hour hotline of the National Suicide Prevention Lifeline is 1-800-273-TALK (1-800-273-8255); TTY: 1-800-799-4TTY (4889). Postpartum symptoms can be reduced in severity and duration with the right support. Many women feel embarrassed or ashamed to express they may be suffering from PPD. It’s important to know it is not a character flaw but a medical condition that can be treated with professional help.